Directorate of Culture Khyber Pakhtunkhwa has Re-advertised the KPK Internship Program in different locations of KPK. Those candidates who are interested in internship program they should get all information about Internship over here. Applicants who want to apply for the internship program they should posses following qualification Master OR Bachelor’s Degree in any discipline but preference will be given to Master in Social Science, Computer Science, and Languages. All male and female candidates are invited to apply after meeting the required qualification. The Age limit is up to 30 Years. All the interested applicants who desired to apply for the paid internship they should apply for the Internship for Directorate of Culture as soon as possible. 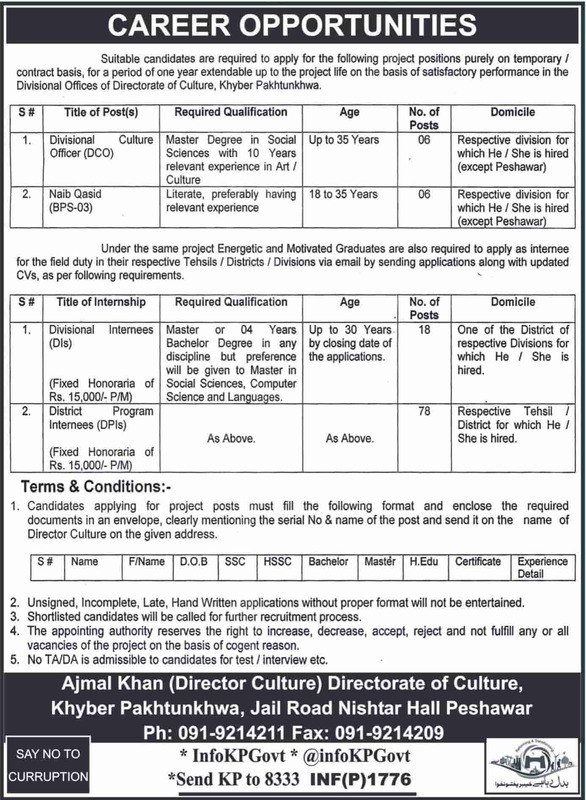 KPK Govt Internship 2019 Directorate of Culture Apply online being added to this site. Candidates who fulfill the criteria they should apply for the Internship program within due date. Applicants should know that incomplete or incorrect information and late submission will not be entertained. All the candidates can apply through Online Mood by Email only. Further Information being pasted over here. Both Males & Females can apply. Required qualification is Masters OR Bachelors Degree in any Discipline. Master in Social Science, Computer Science, and Languages. All the candidates can apply through online mood by Email only. Email your up to date CV with application form to the authority.